Oil, pipeline development, drugs, tourism, – all good reasons to lust after the land around the Mediterranean Sea. US resources are being used to accomplish this land grab – the military might, lives and health of our children, all funded by your tax dollars. 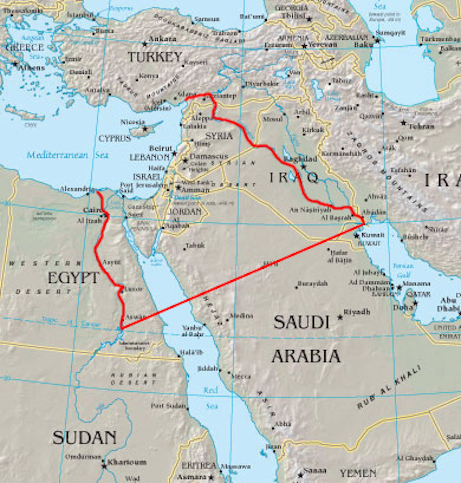 But was this land – “Greater Israel” – really promised to the current leaders and residents of Israel? Are are the current residents and leaders of Zionism usurpers of the covenant – Eastern European Khazarians (Ashkenazis) who converted to Judaism in 740 AD. How can they claim to be recipients of the original real estate deal? The Ashkenazi were from Khazaria – a region north of the Black Sea to the Caspian Sea… From Kiev in eastern Europe, the south and east of Russia. The original tribe, the group that was close to God, was of Sephardic Jews who are genetically indistinguishable from the Arab population – resembling those who constitute the current Palestinian population.